Forget Bugatti Veyrons, Gumpert Apollos, and Pagani Huayras. The world's quickest street legal car is a Vauxhall Victor. At the FIA European Drag Racing Championship at Santa Pod on June 1st/4th Wolverhampton’s Andy Frost hit 219.29mph in 6.714 seconds in his slightly modified 1970 Vauxhall Victor FD. Red Victor 3 is the world’s only street legal Pro Modified machine competing in the MSA British Drag Racing Championship. 209 miles per hour across the finish line. Drag racing had many pure competition machines that are quicker and faster, but none that could also be driven on public roads. Then along came Andy Frost entered from Wolverhampton. Frost bought his Vauxhall Victor second-hand 30 years ago and has steadily transformed it from a 1970 family saloon into the street-and-strip monster it is today. 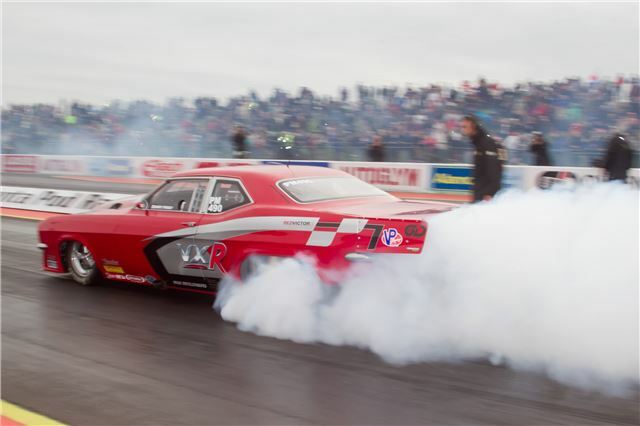 At Easter, red Victor 3 hit 219.29mph on the Santa Pod dragstrip to shatter the American’s record by a clear 10 miles an hour. Then, on Jubilee weekend Saturday, Frost covered the quarter-mile in 6.714 seconds to nip Saboury’s ET and claim both records for Britain. Then on Jubilee Monday, Frost really nailed it with a 6.592sec/220.09mph run to take the record into new territory. And it’s still early in Red Victor 3’s development. At every stage of his car’s transformation, Frost has carefully maintained its street-legal status. The winkers wink and the wipers wipe; there’s a tax disc on the windscreen and number plates front and rear. A YouTube video shows the car bowling merrily – and legally – along the A45 near Wellingborough. becomes a beast. The world’s most powerful production car, the £1.7million Bugatti Veyron Super-Sport, generates 1,000 horsepower. In warrior mode, Red Victor 3 packs three times that punch under its bonnet but its Vauxhall Victor outline gives little hint of what lies beneath. Drag racing originated in America as a road-safety initiative to discourage drivers from racing on public highways and to vent their competitive instincts instead in private surroundings. caution. It is the principle of creating the quickest, fastest road-legal car that excites him; the practice is confined entirely to the racetrack. You Tube video of Red Victor 3 on the street. You Tube video of red Victor 3 on the strip.